New Delhi: The 'God of Cricket' Sachin Tendulkar took to Twitter on Thursday to announce the release of the trailer of Sachin A Billion Dreams, a biopic celebrating his life, his cricketing career and his billion-strong fan base. While parts of it are dramatised, the trailer also features original footage from his blockbuster cricket matches as well as interviews with him, his family and those closest to him. In less than 24 hours, the trailer has over 5 million views on YouTube and 5 million views on Facebook. The hashtag #SachinABillionDreams was among the top two trends on Twitter for most of Thursday night. The trailer opens with a mischievous young Tendulkar playing a prank on his neighbour. Cut to the 1983 World Cup. "I was just 10-years-old when India won the World Cup in 1983," the Master Blaster explains in a voice over. "That's when my journey began. I too wanted to hold the World Cup in my hands." His wife Anjali Tendulkar also features in the trailer and reveals a different side of the cricketing icon. "Cricket was first and we were all second. We accepted it," she says. "When the team didn't do well, he would be so upset that he wouldn't be able to sleep at night." A happy surprise is the brief appearance of former Indian captain Mahendra Singh Dhoni, who says: "I would ask people to let me know when Sachin comes in to bat." "For me, playing cricket was like going to a temple," the Master Blaster says, in a line that's resonating with many who grew up worshipping him. I wonder if Sachin's mother ever had to say roti nahi kayenge tho khelne nahi dunga!! Directed by Emmy-nominated filmmaker James Erskine, the biopic has music scored by Oscar-winning composer AR Rahman. 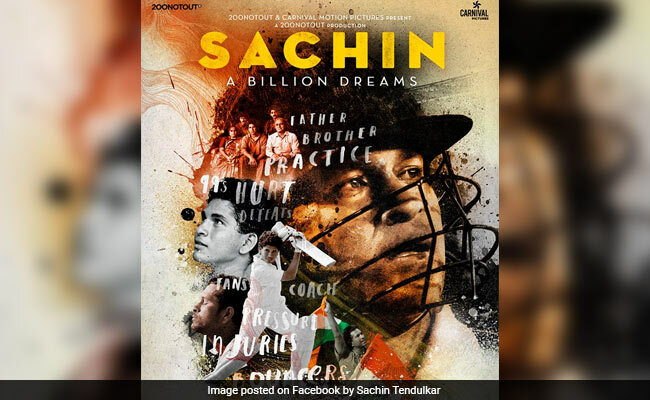 Sachin: A Billion Dreams will release in Hindi, Marathi, English, Tamil and Telugu and is set to hit screens on May 26. But clearly, that date can't come fast enough for Sachin fans.